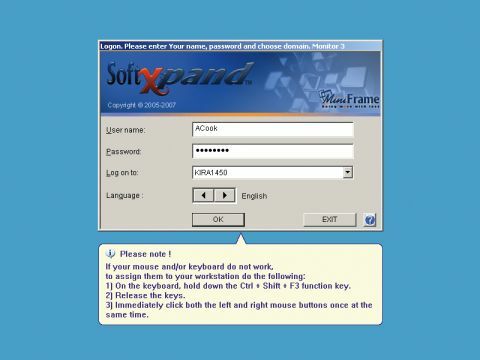 SoftXpand allows a PC running Windows XP Professional to support up to six users, each of whom need only a monitor, keyboard and mouse. This is achieved by using a dual-head graphics cards (PCI Express recommended) in the host PC and a mini USB hub per user for the keyboards and mice. If you're starting from scratch, the UK distributor can also provide the central PC, which has three PCI Express slots for six users. Typically, a SoftXpand solution – including the software, host PC, monitors, keyboards and mice – will cost £1,476 to £2,008 for four to six users, compared to about £1,720 to £2,580 for multiple mid-range PCs. The solution becomes very attractive for just two users if you already have a powerful PC that you can build on. Thinking green, MiniFrame suggests a reduction in electricity consumption from 510W to 120W per hour for six users. For standard office apps, the reduction in response due to competition for resources is barely noticeable.